A dosa is a lentil flour crepe. It's crispy and thin and flavorless. It's also unstuffed. You're supposed to rip it apart and dip it in spicy stuff. Unfortunately, I never got used to spicy stuff for breakfast. 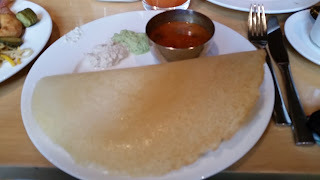 I was hoping the dosa itself would have more taste.